On weekdays, Victoria St Cafe is one of the first cafes open in the Wellington CBD to serve you with a tasty all day breakfast. Enjoy your meal and a great coffee in our relaxing surroundings. Located in central Wellington at 98 Victoria Street (on the corner of Victoria and Bond streets), just a hop, skip and a jump from Civic Square, we offer a range of breakfast options to sustain you as your day begins. As well as our legendary cooked all day breakfast, there’s also muesli or porridge to soothe you before that big meeting or just another busy day in the big smoke! We also serve up a fantastic selection of sandwiches and paninis – or choose something more substantial from our lunch menu. Emporio Coffee are our trusted coffee suppliers, so enjoy a flat white or espresso made by one of our experienced baristas, or sample a freshly squeezed juice or a delicious fruit smoothie. Our hours are 6.30am to 4pm Monday to Friday; and 8.30am to 4pm Saturday and Sunday. My home away from home. I love your cafe; great food, coffee, staff and atmosphere. Cheers, Les! We take a fair bit of pride in the food, coffee and service we provide. With more than 50 years’ combined experience, Kieran and John love creating delicious meals using the best local produce, free-range eggs and wholesome ingredients. Revel in our cabinet delights, savoury lunches and healthy sandwiches. Whether you’re after an all day breakfast or lunch, or just passing through, make Victoria St Cafe your food destination. Impress your clients or put a smile on your workmates’ faces. The team at Victoria St Cafe have years of experience, which ensures you get the best food, beverages and service at a price you can afford. Your food is delivered plated and ready to serve. Don’t worry if it’s short notice, we can put something together for you. We provide catering seven days a week. Planning a Christmas function, birthday party or staff leaving celebration? Victoria St Cafe is available for hire for private functions. Gather your friends or colleagues and celebrate in the privacy of our cafe. Personalise the room and the food to exactly what you need. We’re fully licensed, so we can include a chilled beer or a glass of your favourite sauvignon blanc. Victoria St Cafe were shortlisted as 2016 NZ Café of the Year finalists in the Best Metro/CBD Café in the Wellington Region category. We have produced a video homage to the locally sourced, sustainably farmed black pudding we serve in our cafe. The video was made and narrated by Elliot Lanceley, with an all-star cast featuring Steve Scheckter from On Trays Food Emporium, Gordon the butcher, and Victoria St Cafe co-owners Kieran Hughes and John Wiggins. Try this delicious, locally made product in our cafe – it’s featured on our menu, with crushed potatoes, poached eggs, and hollandaise. 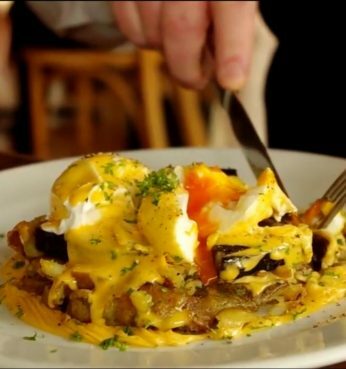 Eggs feature in many of our customers’ favourite meals – from eggs benedict to the legendary Big Breakfast. Capital Eggs supply us with fresh, locally sourced, free-range eggs. “We deliver in chilled vehicles within 24 hours of the eggs arriving from the farm, so they’re super-fresh when they reach our clients,” says Laurie Watkins, Capital Eggs’ sales manager. “They offer good service, a great, fresh product, and we really like the way they do business,” say Kieran and John, cafe co-owners. “Victoria St Cafe might have an ‘egg emergency’ and need more product delivered at short notice. We go the extra mile – personalised service is where it’s at for us,” says Laurie. Long may Capital Eggs rule the Wellington eggverse! Main course: Glazed ham on the bone with homemade wholegrain mustard and piccalilli, minted new potatoes, asparagus and fresh peas. 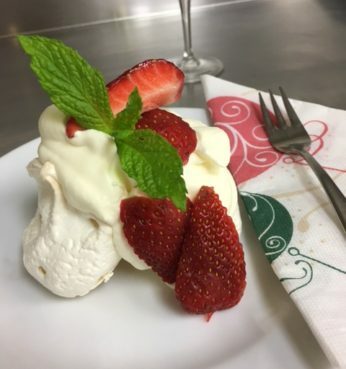 Dessert: Pavlova with fresh berries and whipped cream. Glass of bubbles: Twin Islands Brut NV. All for a set price of $35 per person. Get in touch with us to book a table now. 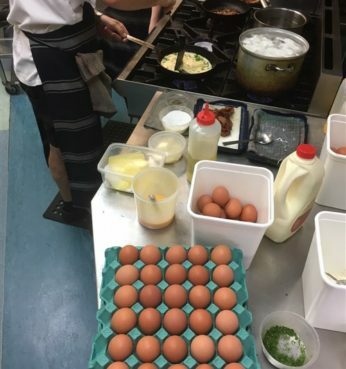 At Victoria St Cafe, we’re big on serving tasty, hearty food that uses the freshest ingredients grown locally or sourced from local suppliers, such as free-range eggs from Capital Eggs. 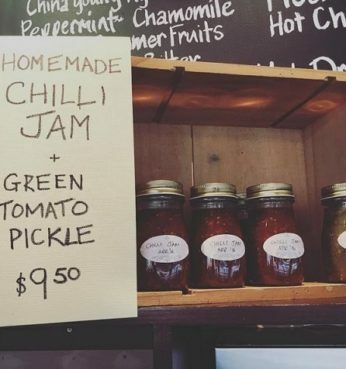 We make and serve homemade preserves, and when there’s been a bumper crop, we offer some – like these jars of jam, and pickles – to our customers. The ingredients were lovingly grown in our Berhampore garden. For the House Smoked Halloumi Salad on our new menu, we smoke blocks of handcrafted halloumi cheese from Moera-based Zany Zeus ourselves. One customer remarked that it was the best salad she’d ever had! We’re supporting Small Talk, a Young Enterprise Scheme business from Saint Mary’s College, Wellington. They are raising awareness about depression, and encouraging positive thoughts with positive talk, “one flat white at a time”. 100% of their profits go to Lifeline Aotearoa. 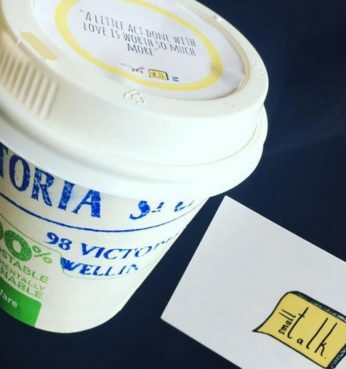 Check out Small Talk’s messages on top of our compostable coffee cups when you drop in to fuel up on the good stuff. 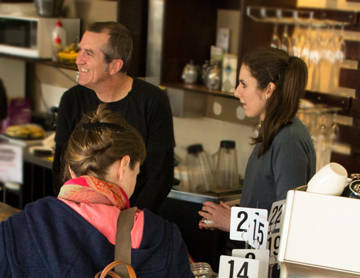 Small Talk and Victoria St Cafe featured on TV3’s Story and Paul Henry’s breakfast show recently.